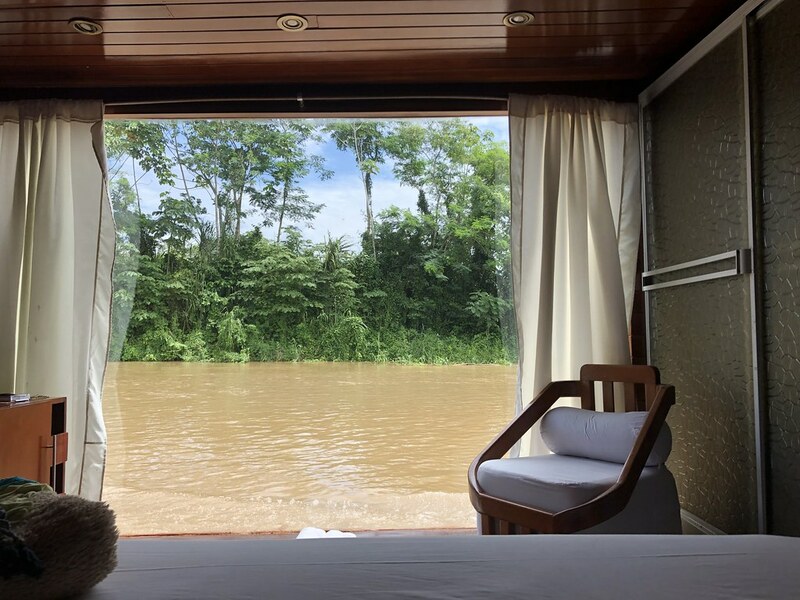 Our 3rd night on our riverboat, the Cattleya, was spent near the confluence of the Ucayali River and the Marañón River, which then becomes known as the Amazon River as it flows into Brazil. The confluence is really wide and really fast. We took our skif out to the middle and just hung out for a bit, it was pretty incredible being there! 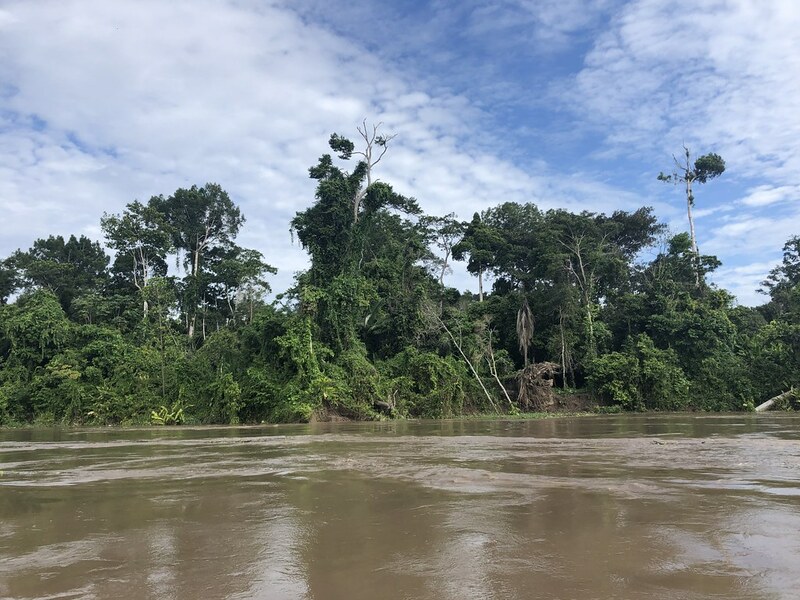 After crossing the confluence, our skif headed deep into the jungle and up a series of small tributaries. It was early evening and again we were watching for wildlife and birds. 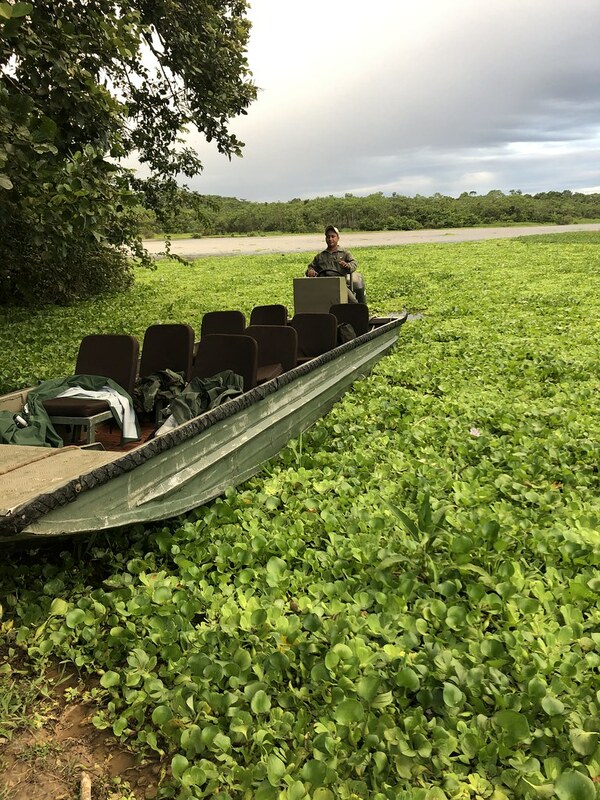 Our first stop was at a small lake that was almost completely choked with water lettuce, making it look like we were traveling over a large green carpet. We slowly made our way around the shoreline, spotting various birds, until we came to a ranger station and went in for a visit. The ranger was very excited to have guests as he lives our there on his own. 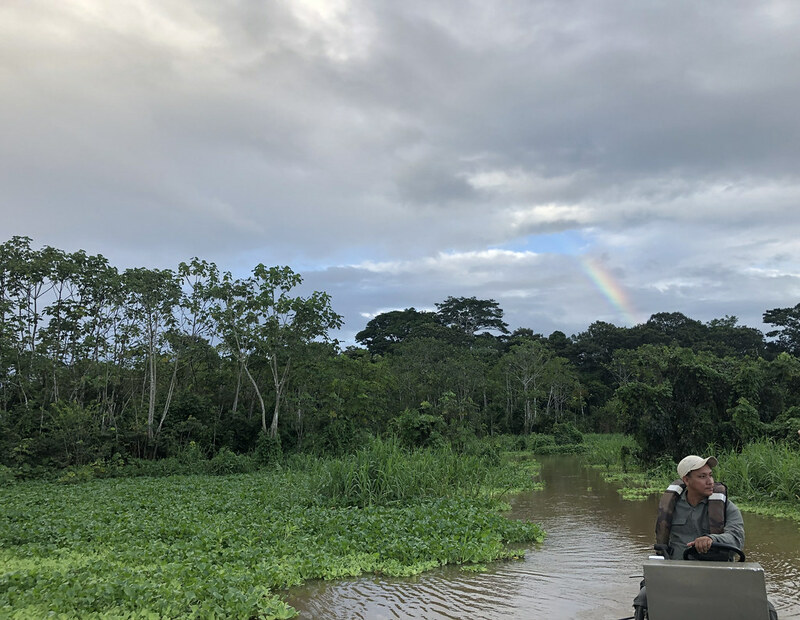 Our naturalist, Hilde brought him a few bottles of water and then he told us about the different wildlife protection programs they are doing in the rainforest. 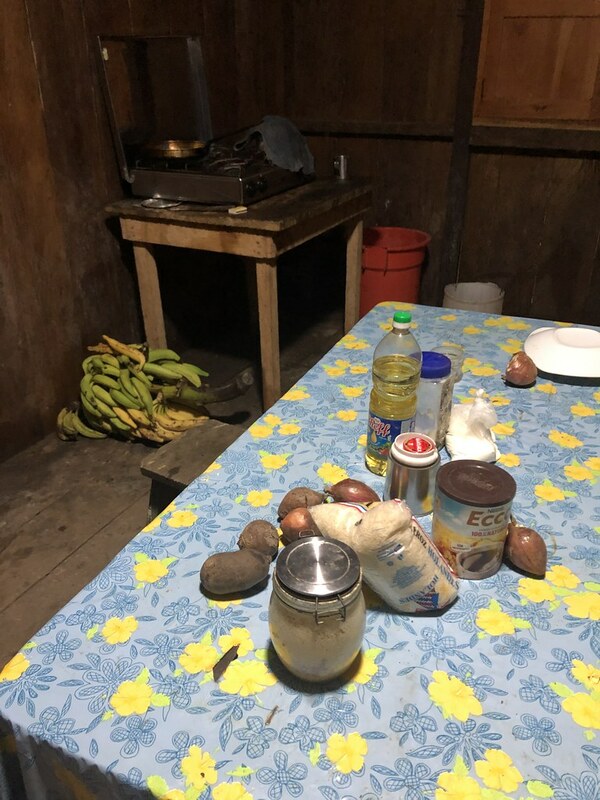 He was living in pretty bare-bones lodging, and I felt a little embarrassed when Hilde showed me his very primitive kitchen. Back in the skif we headed even deeper into the jungle. We would be staying until dark to see and hear how the jungle changes at night. We were all a bit nervous! 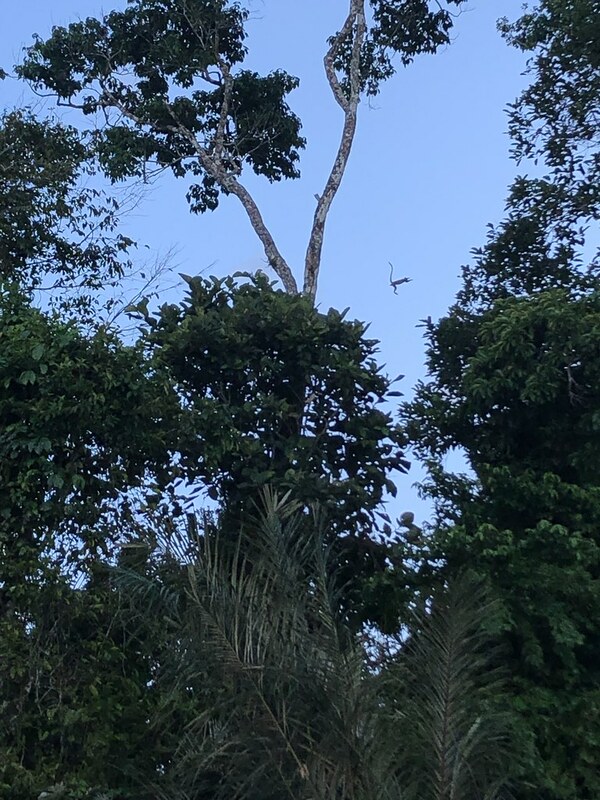 As we continued down smaller and more narrow tributaries, Hilde spotted a snake up in a tree! He kindly mentioned that if it fell in the boat we should move calmly out of the way. Right. We spotted a sloth (much less scary), lots of birds, and motored past a lot of hanging vines and giant lily pads. It was creepy and exciting! We finally came out into another lake right as dusk set in. 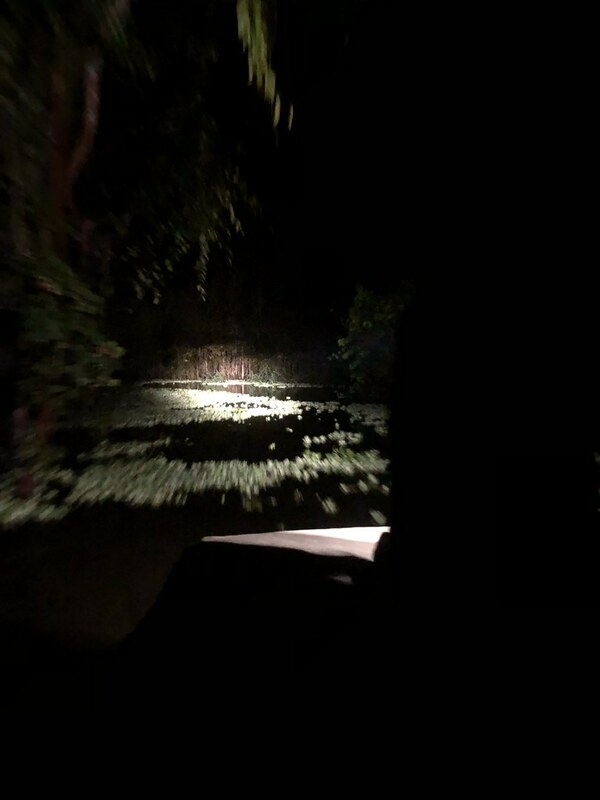 There were lots of noises but very little movement, Hilde took out a spotlight and started sweeping it across the lake looking for the yellow eyes of caiman. He spotted something and we zoomed across the lake. 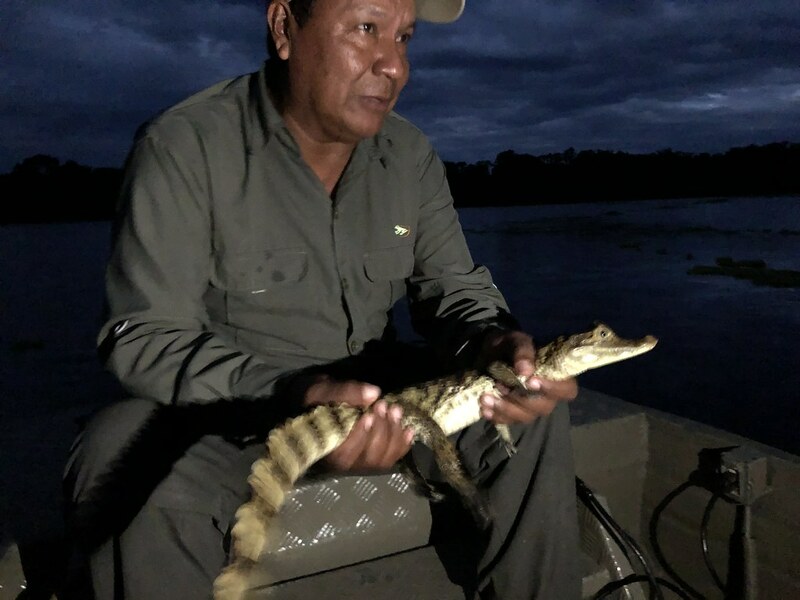 Hilde dipped his hand in the water lettuce and pulled up a small caiman! It was pretty impressive! Our way back was in pitch darkness. Hilde shown the spotlight so our skif captain could navigate and huge bats flew towards it, and us! I'm not a fan!! A river rat also jumped off a low hanging branch into the water and swam in front of the boat. The entire experience was really awesome and also tested my fear levels. 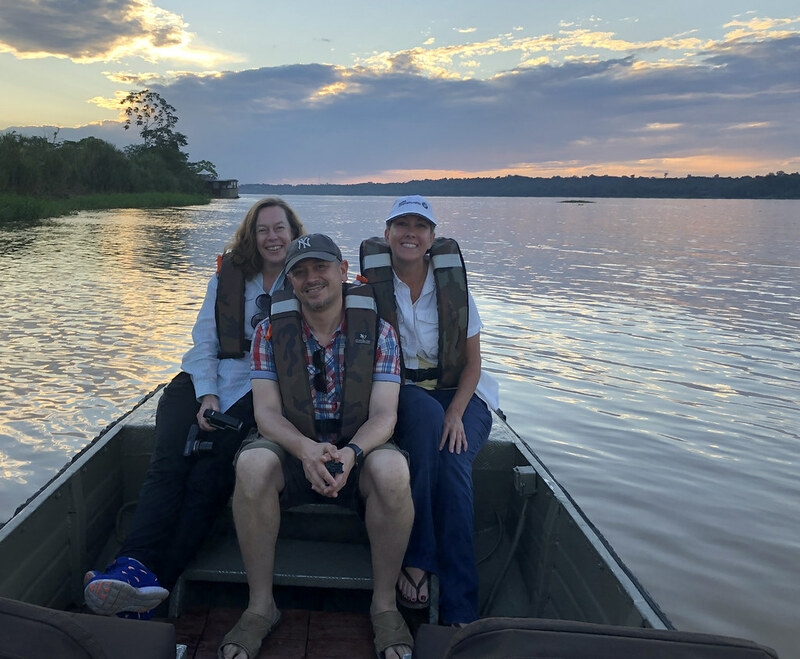 We finally made it out to the main river and crossed the Amazon in the dark! It was good to be back on the Cattleya! The next morning was New Year's Eve! We kicked it off with a jungle hike, this time on the opposite side of Pacaya-Samiria National Reserve. It was another hot and steamy day, the mosquitos at full force again, as we hiked for about 1 1/2 hours. 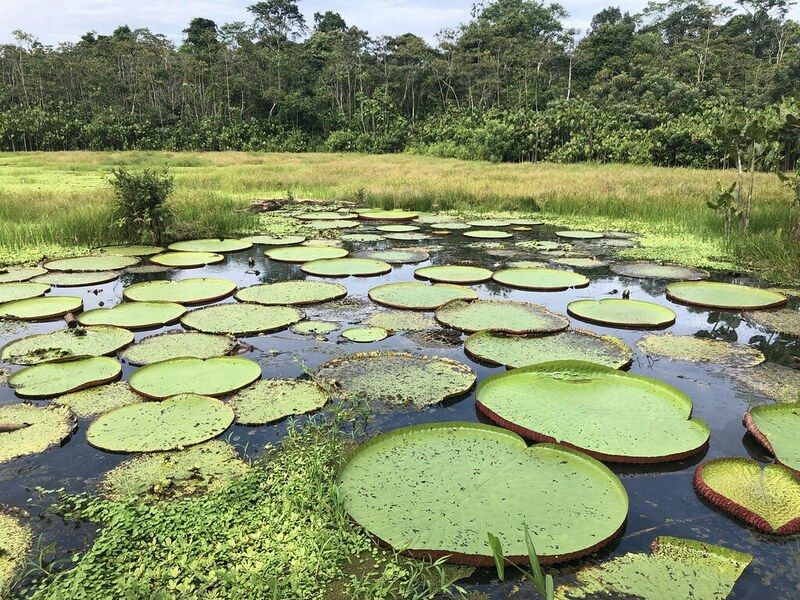 We spotted more birds, lots of different plants/trees/vines, huge termite nests, a tarantula web (minus spider thank god), huge fluffy squirrels, and these beautiful giant lily pads. We were hoping for more monkeys, sloths, a puma, or even a jaguar. At one point on our hike, with Caitlin and I bringing up the rear, we heard something behind us but didn't see anything. Hilde mentioned that the pumas are very curious and will follow people just to see what they are doing. We heard the sounds a few more times but still never saw anything. 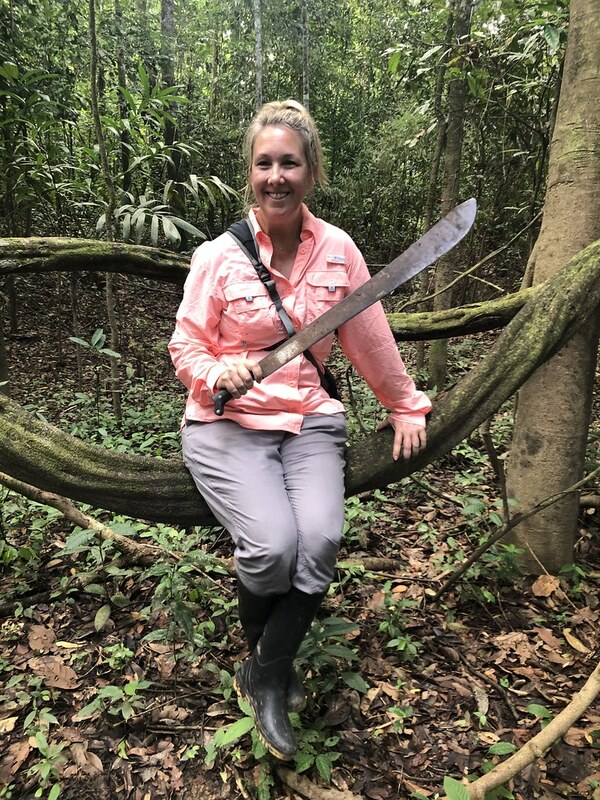 It was nerve-wracking to think about being followed by a puma in the deep jungle with Hilde using his machete to make a path in front of us! We spent the afternoon relaxing as we sailed to our final mooring spot of the trip. We were also treated to a special lunch which used the Amazon fish paiche, wrapped and cooked in banana leaves. We'd learned about the paiche from the ranger the night before, the world's largest freshwater fish that was being overfished in many areas, but this area of the river had strict guidelines in place. These freaky fish actually breathe air and can get to 10 feet in length! Early in the evening Caitlin, Thibault and I headed out for our last skif adventure with Roy and Hilde. 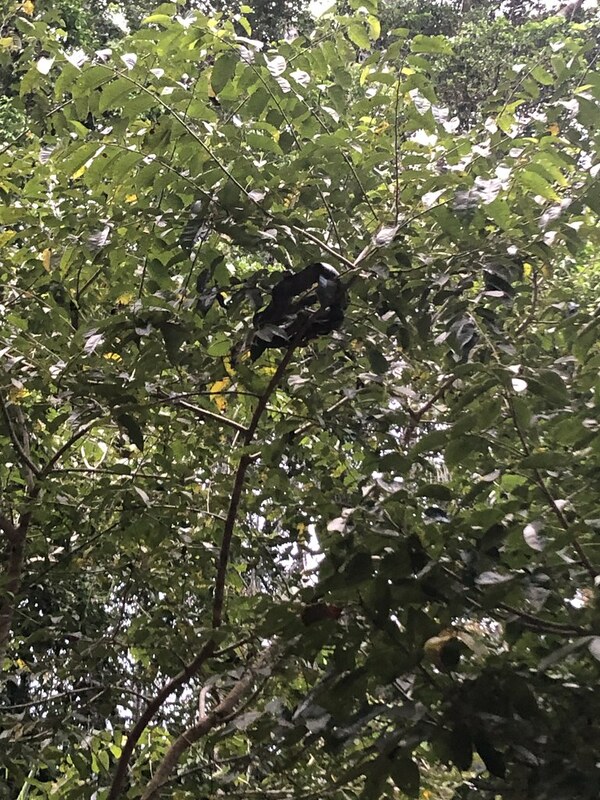 Right away we spotted a very large troop of monkeys making their way from tree to tree through the jungle. We hung out and watched them for quite awhile, they were soooo cute! On our way back to the boat we had the makings of an amazing sunset. Fitting for the last day of 2018! Since the boat had run out of everything except pisco and tonic, we made ourselves sundowners of G&Ts with our own supply of gin. 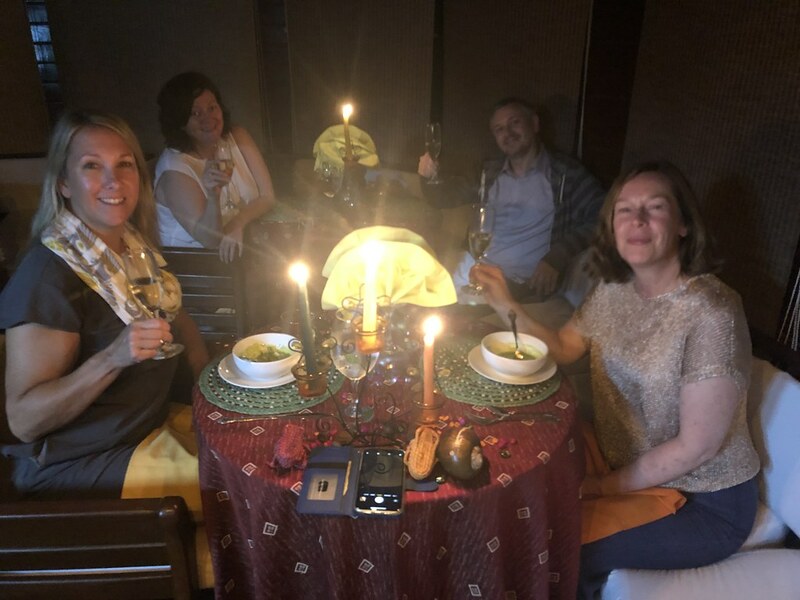 We had also saved one bottle of wine and one of champagne for dinner and had other various flasks of provisions for the rest of the evening. Our dinner table was very festively set for our final dinner of the year! And again, the food was very good. Afterwards we had a little pisco sour party with the crew and even did a bit of dancing. 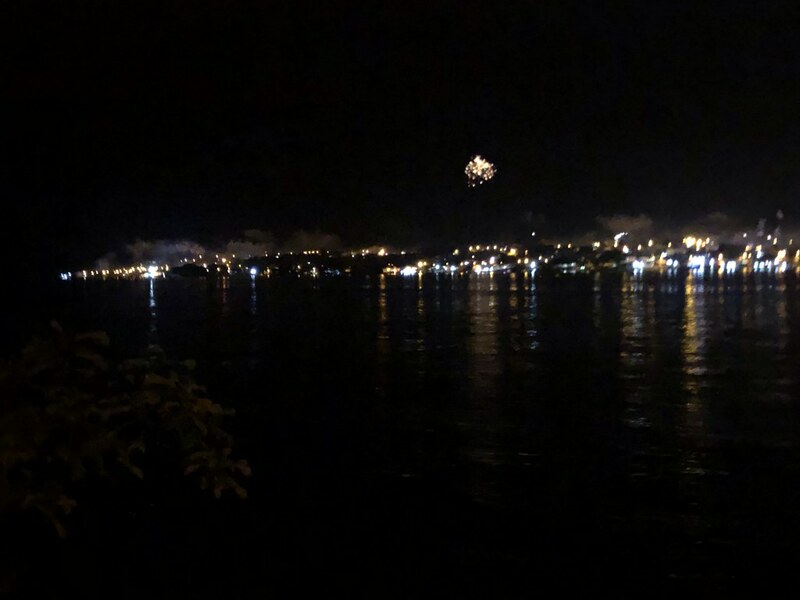 At midnight we rushed up to the observation deck as we heard fireworks across the river. I think this was the 2nd smallest show we'd ever seen (Phuket was the smallest if I remember correctly) but it's still always fun to have fireworks on New Year's Eve, especially unexpected ones. The next morning our packed bags were picked up from our rooms and loaded onto the skif. After breakfast we had one last ride over to Nauta, where we were transferred to our van for the drive back to Iquitos airport. All told we saw sloths, monkeys, 3 different types of bats, pink and grey river dolphins, Amazon red squirrels, an Amazon bamboo rat, caiman, an anaconda, a tiger snake, a poison frog, piranha, various ants and butterflies, and 39 different species of birds (we had a log that we kept our days sightings in)! Pretty impressive! 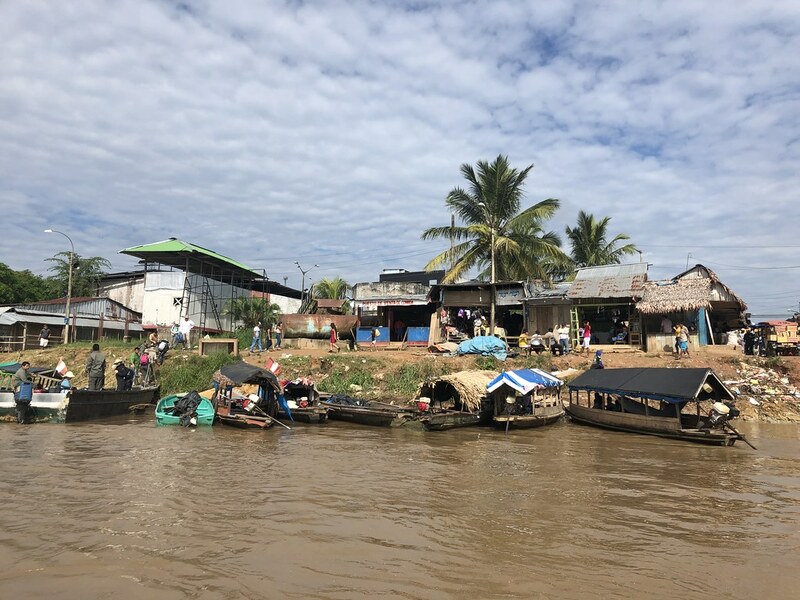 The cruise and the Amazon jungle were an amazing, and once-in-a-lifetime experience, but it wasn't without some disappointments, such as the oversight in stocking what we asked to have onboard. We did end up negotiating a refunded price with the company we booked with afterwards. Additionally, the boat itself was run by another company which I would not be able to recommend due to some behaviors that we experienced onboard. I won't go into it here, but if you are considering booking with their boat and want to privately message me, I've be happy to give more information. We were off to our next destination and to see the Inca ruins! All Amazon rainforest photos here.